thus for the sake of God and our profession we must stand by them: If you will not clearly and meaningfully rescind the charge of our having committed 17 errors in our refutation and acknowledge your own errors, then either you must you must be caught up in some deep delusion or willingly resisting the truth and want to persist in an obstinant, tyrannical and loveless vain and spirit. — Consider it well, for you're not just doing it to us but to God, and if you refuse His truth He can easily plunge you into much greater confusion and deeper delusion in His righteous wrath. You will have to give Him testimony on Judgment Day of our righteousness whether you accepted it or not. If you assume and declare that everything, which we wrote and which is not according to your design, is false and erroneous, separatistic and sinful, then we have responded to you for the last time and must turn our sighs about you to God, for you, not we, are guilty of the rift between us and you, whereby many souls have certainly been made heretical and belligerant. Turn away from this and bestow honor upon the divine truth, which we have proven to you through text and church teaching! Perhaps then your two brothers in office, Krause and Kindermann, will follow your example and come to another conclusion than that which has been expressed because of your emphatic example. Do not worry that your office will suffer due to a public acknowledgement of your mistakes. All the righteous will then express a proper confidence in you and the entire world and the devils may have ridiculed us but our souls will be saved and Christ will be on our side. He bestows grace to all who call Him and richly forgives the sins of all who believe in Him and hold fast to His cross and service. Indeed He delivered His apostles from many errors and sins; may He be a merciful lord and savior to us too, His servants, may He purify and temper us; may He bestow upon you, beloved brother in office, the proper clarity and humility, the proper love and meekness, the proper comfort and support, through His Holy Spirit, for the sake of His goodness and truth. Amen. Altenburg, Perry County, Missouri; January 15, 1845. To God alone the honor and to no other! God's grace and help be with you! 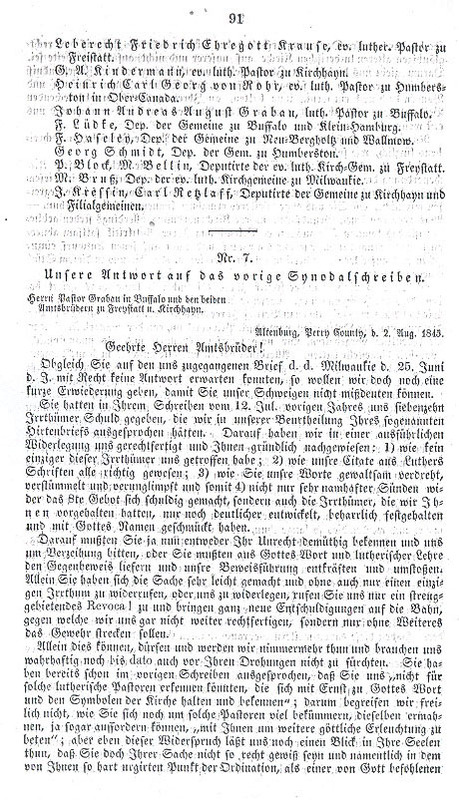 With regard to the exchange of letters, which you have conducted with us since 1840, the assembled Lutheran Synod in session here since June 3rd of this year finds itself moved to make to you the following brotherly remonstrance. 1. We warn you to rescind your church and congregation order of 1839 and 1840. Reason: It stems from obvious innovations and devalues the Lutheran preaching office, which is contrary to God's word and the symbols of the church. 2. 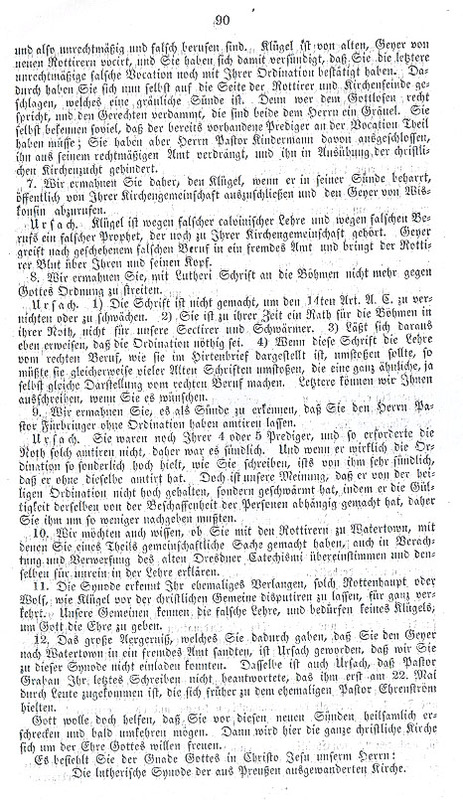 We warn you to maintain with us the unabridged continuation of the Lutheran preaching office, thus relying on neither the favor nor displeasure of the congregations, to which you have extended completely papist rights of close examination and deliberation on their preachers in your new church order. We are not sure just how many you have changed. 3. 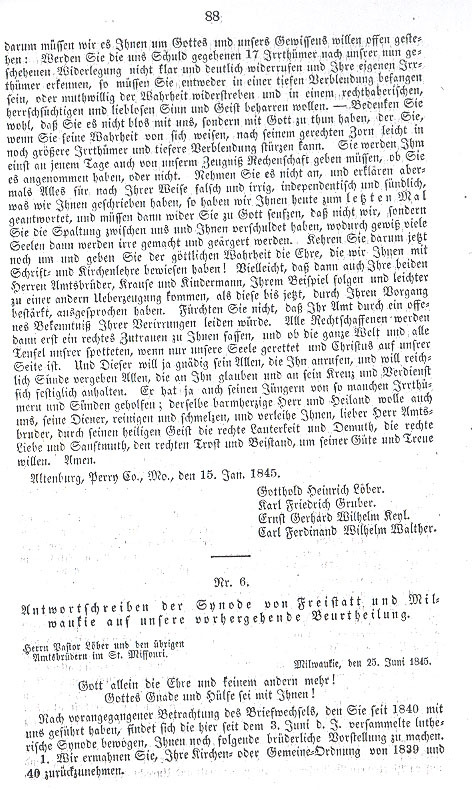 We warn you to recognize that in 1843 you did not send Pastor Grabau a brotherly report but rather an extensive critique whereby you committed the sin of censorship in that you did not address the current point of erroneous teaching but rather only your deliberations and their possible consequences. Your critique has become the authority looked to by those fallen from the church, who claim they suffered injustice, and it is to blame for the false doctrine in the Lutheran church in Buffalo and Wisconsin, with which the fallen members are indulged and many souls in our congregations are seduced. You have let your response to the anticritique be broadcast to our congregation members by Mr. Geier and because of it the mutineers have been handed a new means for declaring our church false under your authority. Through this means members of our congregations have fallen in league with Mr. Geier and been drawn to you. 4. We warn you to abandon your lax teaching on vocation to the holy preaching office. Reason. 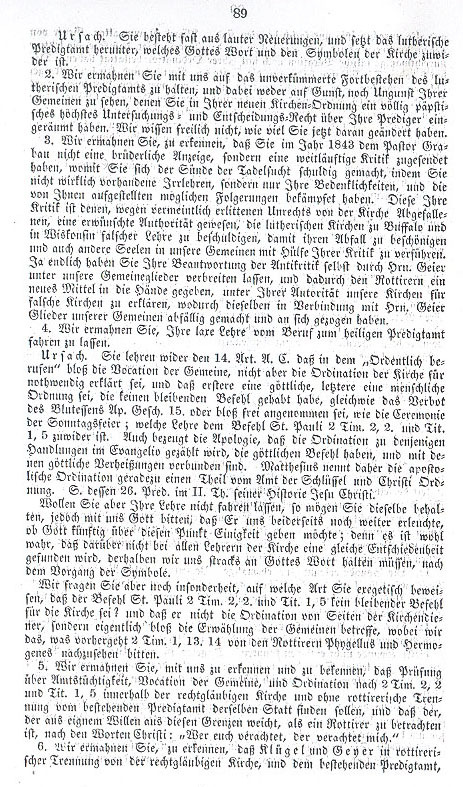 You teach contrary to the 14th Article of the Augsburg Confession, in stating under "ordained vocation" that only the vocation of the congregation is necessary, not the ordination of the church and that the former is divine order but the later is human ordering, which has no command behind it, just as the prohibition against blood feasting in Acts 15 or optional ceremonies such as Sunday service; such teaching is contrary to the command of St. Paul in 2 Timothy 2, 2 and Titus 1, 5. Even the Apology shows that ordination is counted among the operations in the gospels, which have divine command and with which divine promise is bound. Matthew calls apostolic ordination a portion of the office of keys and Christian order. See the 26th sermon in II Thessalonians for the history of Jesus Christ. We would particularly like to ask you what form of exegesis you use to prove that the command of St. Paul in 2 Timothy 2, 2 and Titus 1, 5 has no command behind it? And that he does not regard ordination by church servants but merely choosing of the congregation - we ask you to take a look at what happened to the mutineers Phygellus and Hermogenes in 2 Timothy 1, 13 and 14. 5. We warn you to acknowledge and profess with us that testing of ability to conduct the office, vocation of the congregation and ordination according to 2 Timothy 2, 2 and Titus 1, 5 shall have a place within the righteous faith church without mutinous schism from the existent ministry and that those, who voluntarily withdraw from these parishes will be regarded as mutineers - according to the words of Christ: "Those, who despise you, despise me." and are therefore improperly and falsely called. Klügel was called by old mutineeers and Geyer from new ones and you have sinned in that you confirmed the latter improper and false vocation with his ordination. In doing this you have sided with the mutineers and the enemies of the church and this is a horrible sin. For both the man, who calls the godless righteous, and the man, who damns the righteous, are abominations to the Lord. They themselves know that the preachers already at hand must take part in the vocation; you however have shut out Pastor Kindermann, driven him from his rightful office and hindered him in the exercises of Christian discipline. 7. We warn you, if Klügel persists in his sins that he be publically dispensed from office by your church community and Geyer should be called back from Wisconsin. Reason: Klügel is a false prophet because of his false Calvanist teaching and his false vocation yet he still belongs to your church community. Geyer is seizing a foreign office and pours mutinous blood over your heads and his own. 8. We warn you to cease disputing God's order by using Luther's letter to the Bohemians. Reason: 1)The text is not created in order to annul or enfeeble the 14th Article of the Augsburg Confession. 2) At its time the letter gave advice to the Bohemians in their time of need; if is not for our sectarians and fanatics. 3) Let is be thusly proved that ordination is necessary. 4) If this text has overturned teaching concerning proper vocation, as it is expoinded in the pastoral letter, then it must likewise overtrun many older txts, which posit an entirely similar, indeed same depiction of proper vocation. We could write you about this later if you like. 9. We warn you to consider it a sin that you have allowed Pastor Fübringer to conduct the office without ordination. Reason: There were 4 or 5 of you preachers and it was not necessary to conduct the office that way, so it was sinful. And if he really holds ordination as high as you have written, then its even more sinful that he conducted the office without ordination. It is our opinion that he does not hold ordination high but rather that he is confused since he has made the validity of it contingent upon the character of the individual; you should have yielded to him to a far lesser degree. 10. We would like to know whether you have anything to do with the mutiny in Watertown since you seem to have some things in common; also do you agree with the scorning and rejection of the old Dresden Catechism and have you declared it heretical? 11. The synod recognizes your erstwhile perverted desire to allow such mutineers or wolves, such as Klügel, to debate before the Christian congregation. Our congregations know the false teaching and need no Klügels to give honor to God. 12. The great vexation, which you produced by sending Geyer to Watertown to fill a foreign office, has become the reason why we could not invite you to this synod. It is also the reason why Pastor Grabau did not answer your last letter, which first came to him on May 22 through people, who previously belonged to Pastor Ehrenström. May God help you that you may blessedly shrink from the new sins and soon turn from this path. The entire Christian church will then rejoice for the glory of God. Leberecht Friedrich Ehregott Krause, ev. luth. Heinrich Carl Georg von Rohr, ev. luth. P. Block, M. Bellin, deputized to the ev. luth. Although you might legitimately expect no answer to the letter sent to us from Milwaukee on June 25th of this year, we wish to render a brief response so that you might not misinterpret our silence. In your letter of July 12th, last year, you presented us with seventeen errors, which we might have expressed in our deliberation to your so-called pastoral letter. We have justified ourselves in a detailed refutation and have fundamentally proven to you: 1) how none of these errors referred to us; 2) how our citations from Luther's works had been correct; 3) how you violently twisted, garbled and discredited our words and thereby 4) not only committed very specific sins against the 8th Commandment but also you clearly transformed these errors, which we showed you, stubbornly held to them and adorned them with the name of God. You either have to meekly admit your injustice and ask us for forgiveness or you must deliver counterproof from God's word and Lutheran teaching and invalidate and overturn our evidence. But you have made light of the affair and without taking back a single charge of error or refuting us, you call on us to announce a stringent Revoca! and then you bring forth new things we should apologize for, no longer showing our justification, merely laying down our weapons with no further ado. We can never, may never and will never do this and truly we need not fear your threats to date. 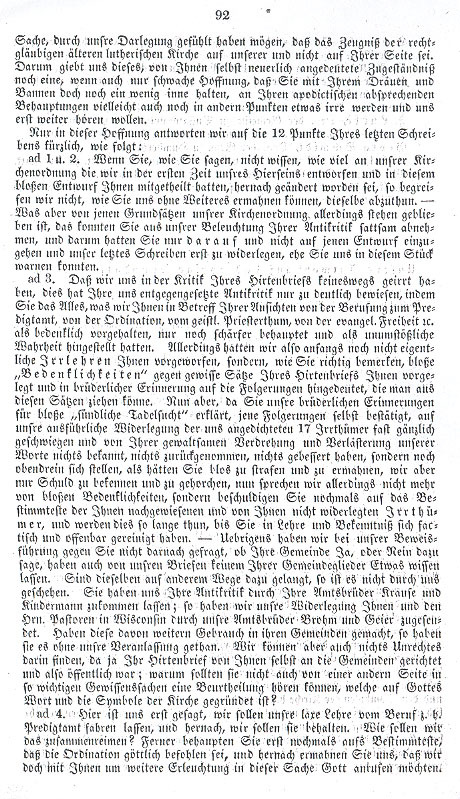 You have already expressed in the previous writing that you "could not recognize us as Lutheran pastors, who maintain and profess with earnestness the word of God and the symbols of the church;" we do not comprehend how you could still bother with these pastors, warn them, and even require them "to pray with you for greater divine enlightenment;" it is just this contradiction which allows us to take a look into your soul and see that you are not really that certain concerning the matter of ordination, a point which you emphasized so urgently as having been commanded by God. Because of our explanation you might have felt that the testimony of the righteous faith, old Lutheran church was on our side and not on yours. This concession which you hinted at gives us hope, if only remote one, that you still hold back some of your threatening and banning, that in other points you become confused about your declarations denying apodictic status and are willing to hear more from us. Concerning 1 and 2. If, as you say, you do not know how many church orders we drafted when we first got here and that you only heard about this drafting after it had occurred, then we do not understand how you could warn us without further delay to retract them. — You could adequately gather from our elucidation of your anticritique that the fundamentals of our church order have remained; you only had to go to that and not each draft to refute our last letter before you could have warned us in this text. To 3. That we have not committed error in the critique of your pastoral letter is fundamentally proven in your own anticritique; we consider all things concerning your opinions on vocation to the preaching office, ordination, the spiritual priesthood, evangelical freedom, etc. open to question. You have maintained everything more intensely and have posited it as irrefutable truth. At the start we did not reproach you for any errors, as you correctly noticed; we presented to you mere "considerations" in opposition to certain sentences of your pastoral letter and intimated in fraternal admonition the conclusions one could draw from them. However since you have declared our fraternal admonition "sinful censorship," have confirmed all conclusions of our cited refutation, whose 17 errors attributed to us have us quite speechless, and concerning your authoritative twisting and slandering of our words nothing is known, nor taken back nor ameliorated. Moreover things are put as though you had merely to warn and to punish while we were duty bound to hear and obey; we no longer speak of mere considerations, rather we are charged to the utmost for errors, which you yourself proved yet would not allow to be refuted and it will exist this way until you have actually and publically cleansed yourself in teaching and profession. — Incidentally, while producing our evidence we have not asked your congregation whether they say "yes" or "no" to it and in our letters we have let things be known to none of your congregational members. If things turned out otherwise it is not because of us. Your anticritique arrived to us through your brothers in office, Krause and Kindermann; we sent out refutation to you and the pastors in Wisconsin through our brothers in office, Brohm and Geier. If these men made further use of it in their congregation, it was done without our prompting. However we also cannot find anything wrong with that since you yourself directed your pastoral letter to the congregations and thus made it public knowledge; why shouldn't they be able to hear a decision from our side in such important matters of faith, which is grounded in the word of God and the symbols of the church? To 4. Here it is primarily stated to us that we should let go of our lax teaching concerning vocation, etc., and hereafter we should maintain it. How should we make sense of this? Furthermore you declare once more to the utmost that ordination is divinely commanded, and afterwards you warn us that we might call upon God with you for further enlightenment on these matters.